Los Angeles Lakers fans at Staples Center on Wednesday gave Paul George a heated reception, but the Oklahoma City Thunder star was unfazed. 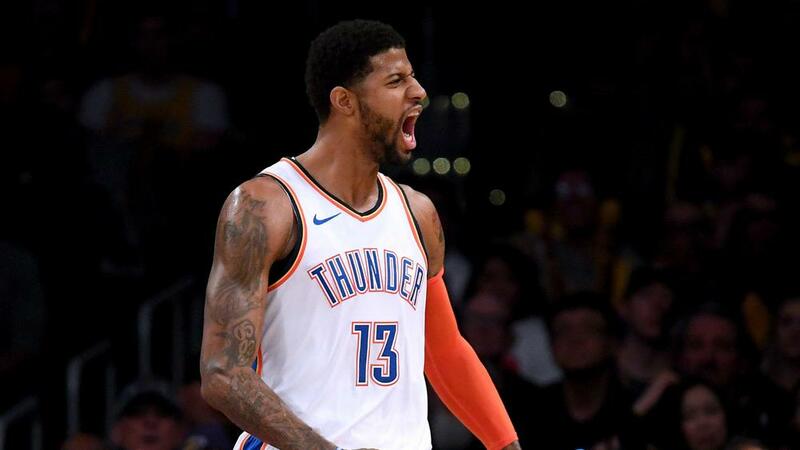 Paul George was happy to play the role of "bad guy" as he was booed during the Oklahoma City Thunder's trip to face the Los Angeles Lakers. Five-time All-Star forward George spurned the Lakers, his hometown team, when he announced ahead of his impending free agency last year he would be signing with the Thunder. Although LeBron James joined the Lakers ahead of the season, fans made it clear they have not forgiven the former Indiana Pacers forward for snubbing them on his first visit to Staples Center since making his decision. George was booed during the player introductions prior to tip-off and during the match but went on to drop 37 points on the Lakers in a 107-100 victory for the Thunder, who also benefited from a triple-double from Russell Westbrook. "I knew coming into it, it was no shock, no surprise. I was prepared for it. It is what it is. I'm the bad guy and that's fine," George told reporters. "Other than saying I would want to play here, and I didn't choose to come here, I'm not the only guy from the LA area that didn't decide to play here. George added that he enjoyed playing in such an atmosphere and is eager for a similar experience when he returns to the Pacers. "It was fun. I look forward to the second time this season where I'll be booed, and that's in the Midwest," he said. "I enjoyed it regardless. The booing wasn't going to throw me off my game. A little booing and a little noise is not going to make me forget to play basketball." Thunder coach Billy Donovan said: "The one thing I would say is that every time this year that I've coach Paul is that every game is important. I don't want to say he was extra amped up for this game. "Obviously, the Lakers have got great history, great tradition, it's a great place to play, great environment. But I would say of all the games we've played this year Paul's really played at a high level in a good number of them."